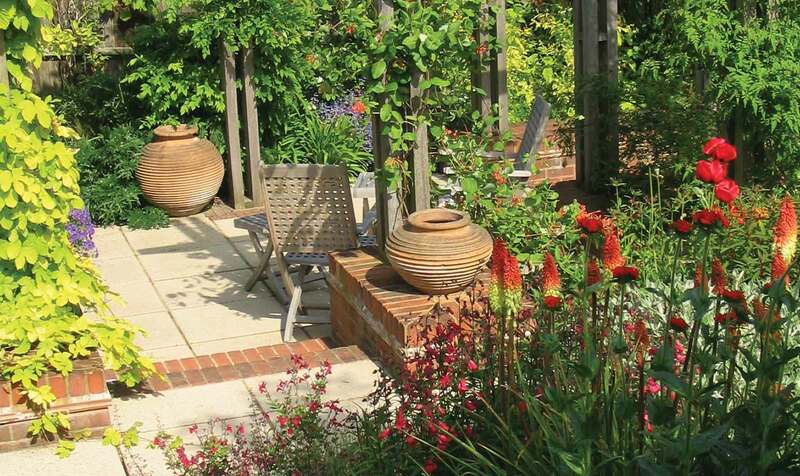 A newly built detached house on a sloping site provided the baseline environment for this suburban garden. The brief set out the requirements of the retired couple who needed an easily managed space with areas for seating and entertaining, contemplation and relaxation. 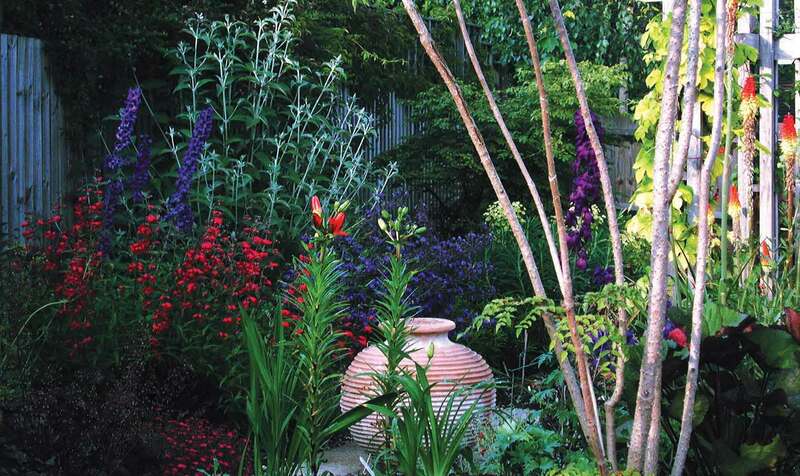 The planting design needed to support a vivid but controlled colour scheme of seasonal variety. In order to give the garden added visual reference in an otherwise bland and featureless housing estate, large scale smooth faced glacial boulders were introduced to the layout. 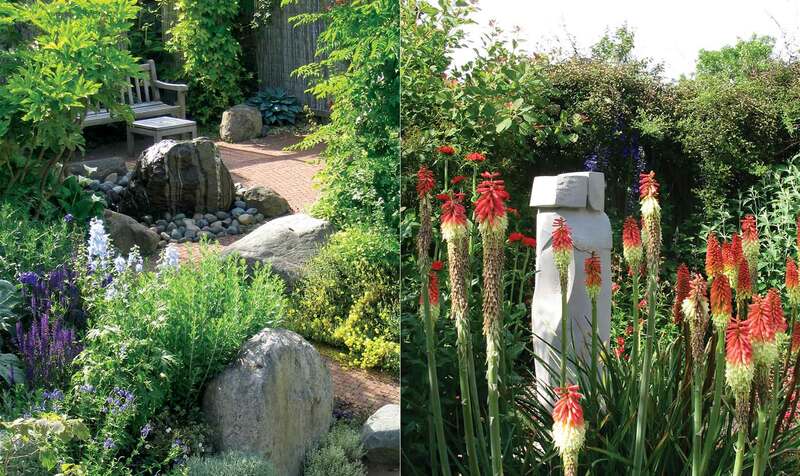 This is a garden in which to let one's mind wander; a temporary escape from reality. The basic design arrangement defined five separate areas to accommodate the natural slope of the site. 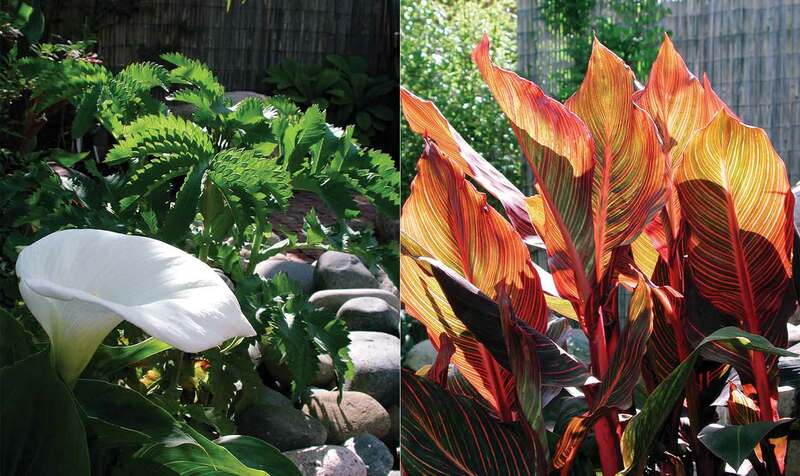 Each area has a distinct character supported by clearly stated colour regimes within the planting. The resultant spatial cells perpetuate a feeling of discovery through changing vistas which allow tantalising glimpses beyond the immediate visual reference. Far from hindering the flow of the scheme the sloping site has given a relatively small space a feeling of depth through the use of elevation and vantage point. There is a clear distinction made between the formal seating areas at lower level and the less structured, organic forms of the upper slopes. The former is reliant on symmetry; using square paving slabs laid to a stack bond pattern, brick seating plinths and hardwood pergola supports; whilst the latter speaks of small unit clay setts laid to a random flowing pattern in sympathy with the rising contours. Further distinctions between areas of the garden are exploited through the use of discrete amenity lighting and a captive drilled rock and cobble water feature.